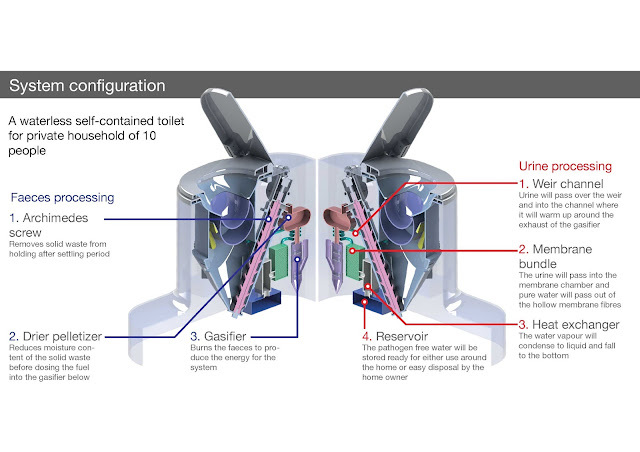 The Nano Membrane Toilet will use gasification to convert the faeces to ash (rendering all pathogens harmless), but also providing an energy source for the toilet processes. The Cranfield team have been working to understand the science behind the gasification of faeces to inform the final design of the gasifier. The first piece of this work is now published in the journal "Energy Conversion and Management" - open access of course! Non-sewered sanitary systems (NSS) are emerging as one of the solutions to poor sanitation because of the limitations of the conventional ﬂush toilet. These new sanitary systems are expected to safely treat faecal waste and operate without external connections to a sewer, water supply or energy source. The Nano Membrane Toilet (NMT) is a unique domestic-scale sanitary solution currently being developed to treat human waste on-site. This toilet will employ a small-scale gasiﬁer to convert human faeces into products of high energy value. This study investigated the suitability of human faeces as a feedstock for gasiﬁcation. It quantiﬁed the recoverable exergy potential from human faeces and explored the optimal routes for thermal conversion, using a thermodynamic equilibrium model. Fresh human faeces were found to have approximately 70–82 wt.% moisture and 3–6 wt.% ash. Product gas resulting from a typical dry human faeces (0 wt.% moisture) had LHV and exergy values of 17.2 MJ/kg and 24 MJ/kg respectively at optimum equivalence ratio of 0.31, values that are comparable to wood biomass. For suitable conversion of moist faecal samples, near combustion operating conditions are required, if an external energy source is not supplied. This is however at 5% loss in the exergy value of the gas, provided both thermal heat and energy of the gas are recovered. This study shows that the maximum recoverable exergy potential from an average adult moist human faeces can be up to 15 MJ/kg, when the gasiﬁer is operated at optimum equivalence ratio of 0.57, excluding heat losses, distribution or other losses that result from operational activities.